There are certain things that you can come to expect from an Ira Sachs film — the dignity he gives to all of his characters, the way in which he can express the emotional distance between characters so close to each other physically, the gentle yet persistent rhythm of how his films unfold with the accumulation of scenes taking on the increasing weight that’s placed on the characters simply by moving through life. The mastery arrives in how unexpected all of it feels now six features in, a fact acknowledged by the recent retrospective at the Museum of Modern Art in New York, and exemplified in his latest “Little Men,” which could be described simply as the story of two young boys from different backgrounds who pursue a dream of attending a prestigious art school yet becomes about so much more. In telling the story of Jake (Theo Taplitz) and Tony (Michael Barbieri), Sachs completes an informal trilogy he started when first began collaborating with co-screenwriter Mauricio Zacharias, each centered on a different generation. In “Keep the Lights On,” the director drew upon his own experience of his twenties to tackle the ups and downs of a relationship between two men that gradually becomes poisoned by drug addiction, and followed it up with “Love is Strange,” a valentine to an old couple finally legally allowed to wed, yet find their official union has unthought of consequences. In each, the drama sneaks up on you as it does in “Little Men,” where Jake and Tony’s parents become entangled in an increasingly heated dispute over a piece of real estate in Brooklyn, owned by Jake’s recently deceased grandfather Max and rented out by Tony’s mother Leonor (“Gloria” star Paulina Garcia) for decades to run her dress shop. The title has passed on to Jake’s father Brian (Greg Kinnear), enticed by the skyrocketing property values in the area to see if he can find a tenant willing to pay more than Leonor, yet is also forced to consider the budding friendship between his son and hers after meeting at Max’s wake. While Brian and Leonor’s escalating dispute brings out the worst in one another, Sachs shows with great grace why each are so protective of what they consider to be theirs, chief among those reasons the ability to pass along something to their children who have not yet been bitten with cynicism, though as burgeoning artists – Jake, who sketches, and Tony, who acts – they’re more vulnerable than most. In spite of the often devastating denouements in Sachs’ films, you get the sense that he too refuses to let cynicism in, operating with a generous heart that never overwhelms a keen perception of human nature and shortly before “Little Men” rolls out into theaters after premiering at Sundance and Berlinale earlier this year, Sachs and Taplitz, a talented filmmaker in his own right, spoke about “less being more” and allowing real life to “infect” the film, as well as Sachs’ penchant for bringing all of his characters together at a party early in his films and how chemistry was built between the two young boys at the film’s center. When you have something like this that has so many layers, where do you start out? Ira Sachs: ‎I started out wanting to make a film about childhood. Then I needed a plot. Mauricio Zacharias, my co-writer and I found a good one in two films by [Yasujiro] Ozu made in the ’30s and the ’60s – “I was born, but…” and “Good Morning,” both films about kids who go on strike against their parents, so [we thought] two kids who stop talking to mom and dad, which gives you a throughline dramatically that allows a lot of other things to become part of the story. Then we brought in a lot of experiences. I moved to Brooklyn in 1988 to an Italian neighborhood and I moved onto a Dominican street and [I realized later] I was a white college kid coming in to change the neighborhood, really. Those were memories that I held very closely. Mauricio is from Rio and his family owns a store [in New York] and they were going through the long, protracted process of trying to evict the shop owner. Every time I would hear a different incident, including when they were in a court battle, I knew how dramatic that could be and how universal the question is of ownership and space. Those were some of the elements that took place and became part of the movie. You’ve said each one of your films has been about a different generation – do you actually see your entire filmography as a piece where there’s a connection from one to the next, other than the fact that you made them? Ira Sachs: Yeah, there seemed to be a space after “Love is Strange” to focus on the younger generation. I’ve never focused on characters separately from how they are with other people, so this film was about kids, but it’s also about [how they relate to] adults and parents — it’s about family. It’s about neighborhoods. No one lives in isolation. But I love how cinema can capture childhood. I think it’s got an ebullience that the camera really connects with. And if I think about [my filmography as] one long story, it’s actually from the moment when I started to make films until now — that’s one long story because in every film, where I am in my own life and how I feel emotionally is reflected in the work. That’s the kind of personal cinema that I’m attracted to. You often start your films with friends and family gathering together for a momentous occasion, either in “Forty Shades of Blue” or “Love is Strange” for a wedding or in “Little Men” for a funeral. Besides narrative economy – to introduce your characters – are there other reasons you like this type of introduction? 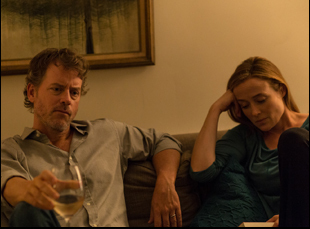 Ira Sachs: I’m always thinking about characters as individuals [both] in intimate relationships with one other person, and then in groups, so I always like a group scene to fill out the larger panorama of the character’s lives. They’re really fun to shoot, to be honest. A party scene means you’re letting things go and there’s a liveliness to it. In this case, what happens is the party scene is in direct opposition to the isolation of the two little men in the film, one being Theo and the other being Greg Kinnear, who’s also a little man [since] he’s lost his father. The isolation that the funeral party provides is really dramatic. It’s also interesting to discover Theo’s actually quite an artist himself, outside of acting, having made a bunch of very accomplished shorts. Did it play a role in casting him? Ira Sachs:‎ I knew he was a creative kid, and I remember he was in a band more than that he made movies. The thing that struck me, watching his initial audition which was on tape, was his emotional intelligence, which stayed throughout the course of making the film up until this day right here. [That tape] was like watching a documentary about the kid in my movie. He’s quick and understanding of how people are, a great asset for an actor. Theo, did knowing what that artistic drive was like factor into the character at all and what was important about this character for you? Theo Taplitz: Jake and I are similar in the ways that we’re both artists – Jake’s artistry is through painting and drawing and mine is through filmmaking, acting and playing guitar and I feel like having these different artistic mediums to express myself allowed me a great deal [of insight] to connect with how Jake was feeling and how important art was to him and how this was more than just wanting to get into LaGuardia. This is something that he loved and wanted to do for the rest of his life. Is it true that there wasn’t much interaction between Theo and Michael Barbieri before shooting? If so, did it help towards having this relationship unfold so naturally on screen? Ira Sachs: There wasn’t much, but there was some. I don’t rehearse with my actors before I start shooting, so we’re not doing table reads and going through scenes, but I do send them out on dates with each other. Michael and Theo spent a long afternoon [together]. You went to a movie – what did you see? Theo Taplitz: We saw “Pixels,” but beforehand we skated around Prospect Park and talked. We also did a Skype session, but Ira told us strictly not to talk about the film, just to figure out who we both were as people. We talked about what music we liked, what movies we were into, and what was going on academically with both of us. Being able to really connect with Michael as a real human being, I feel like that connection [carried] over when we were acting with each other and was really real [in the film]. Is it true the scene between Theo and Michael on the subway wasn’t planned? Ira Sachs: I’m sorry to the MTA because you’re not supposed to bring a camera onto the platform, but we went out to Coney Island and back and we shot most of the way both directions, probably for about four hours. Sometimes what a film needs is some piece of life that in its naturalness infects the rest of the movie and that was one of those scenes where these kids were somewhere between being Jake and Tony and being Theo and Michael. Theo Taplitz: We were talking about Freddy Krueger and roller coasters. Ira Sachs: They had this thing in common and it was great to see them together. It also [becomes] a kind of resolution of the scene in the disco where somehow they help each other get through it. The acting workshop scene is also a showstopper. How much of that was actually scripted versus how much you may have just thrown the cast into the fire? Ira Sachs: What I really do in a scene like that is try to build the world as richly as possible, so that’s Mauricio Bustamante, an acting teacher for kids, with Michael, and the kids in that scene are all kids who go to an acting school called Acting Out in Brooklyn in Bay Ridge, so they all knew each other. They had a history. You start with all the stuff that’s authentic to the world, and then I brought in the idea of using Meisner technique as a way of trying to get things to happen and [make it] really lively. This repetition exercise is a very particular Meisner exercise, and then I let things go. I need to make the fire happen. Since this was Theo’s first feature film as an actor, what was the experience like? Theo Taplitz: First of all, it was pretty amazing knowing that you’re going to be in a feature film. When Ira first e-mailed me that I got the part I was like “yes!” I was really, really excited and the filming process proved to be very informational to me both as an actor and as a filmmaker. Ira taught me so much. He taught me “less is more,” which was a big thing, and he would take me to the side and say, “You should trust the feelings at it is and don’t try to push it at all,” which calls for a lot more of the naturalistic feel to the whole entire thing. That’s something I’ll take with me for the rest of my acting career. Filmmaking-wise, there was so much to learn from the set and Ira encouraged me to go around and ask people. I asked Oscar, the cinematographer, about the Alexa camera and I followed the lighting people around, [asking] “What is that?” to see where the shadow’s been and see where the light bounces. It was an amazing experience. Ira Sachs: It was summer camp. I always try to create that kind of environment to make a film, not because I think it would be nice but because I think you get better work. 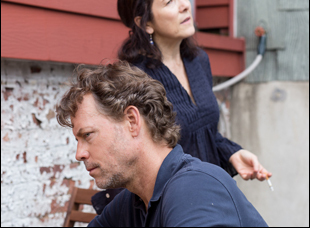 “Little Men” opens on August 5th in New York at the IFC Center and the Elinor Bunin Monroe Film Center. A full list of theaters and dates is here. Interview: Rob Epstein & Jeffrey Friedman on Going with the Flow for "Killing the Colorado"